Marvin Bower described culture as: “The way we do things around here.” What are the kinds of cultures you have experienced in teams or organisations? 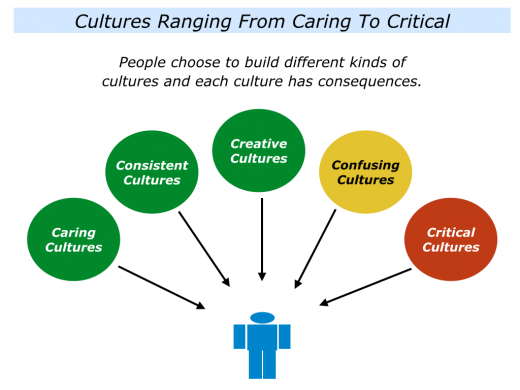 You may have spent time in cultures that are caring, consistent or creative. On the other hand, you may have experienced cultures that are confusing or critical. Let’s explore several different kinds of cultures. When have you experienced a caring culture? You may have had encouraging parents, educators or managers who created an environment in which people could grow. Looking at my own life, I worked with leaders of therapeutic communities who created such places. They had high standards, however, and emphasised that everybody should have this caring ethic. People who joined the communities needed to understand the ethos. They were expected to take responsibility and encourage others, rather than be irresponsible. The caring principles applied to everybody. Caring cultures have many pluses and some minuses. They often create an ethos of kindness, encouragement and respect. Some people may try to take advantage of the situation, however, and expect others to excuse them. Describe a specific time when you experienced a caring culture. Describe what you believe may have been the pluses and any minuses of the culture. 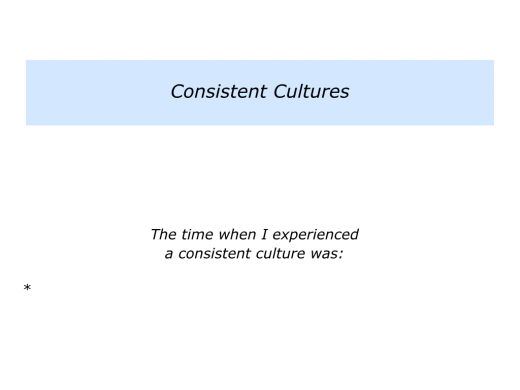 Consistent cultures are those where people give clear messages and actually translate these into action. They do what they say they are going to do. People know where they stand in such cultures. Good leaders, for example, are often like good parents. They are positive, predictable and create an environment in which people can achieve peak performances. Poor leaders are sometimes negative and unpredictable. Such organisations make the professional deal clear. They communicate both the organisation’s and the employee’s responsibilities. They then invite people to choose whether they want to contribute towards achieving the goal. Consistent cultures keep sharing success stories and show people ‘what good looks like.’ They also act decisively if people choose not to follow the required professional standards. If you wish, try tackling the exercise on this theme. This invites you to describe a time when you experienced such a culture. It also invites you to describe the pluses and potential minuses of such an environment. Creative cultures can be stimulating. People enjoy the buzz of working in such environments. They feel alive when using their talents and doing fulfilling work. People often work best when they can align their efforts towards achieving a specific goal. 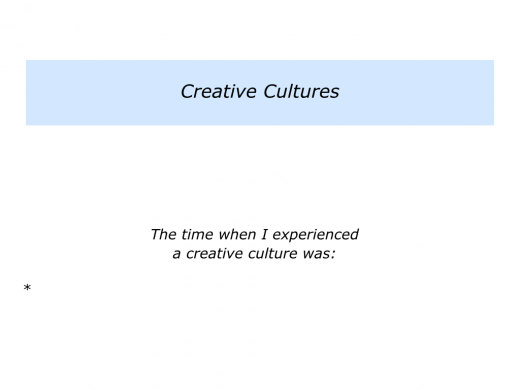 Creative cultures can be exciting, but they can also unpredictable and disorganised. Sometimes people lapse into pursuing their personal agendas. Looking back, when have experienced a creative culture? What were the pluses? What were the minuses? If you wish, try tackling the exercise on this theme. This invites you to describe your experience of being in such a culture. Confusing cultures sometimes have the following characteristics. a) The leaders say one thing, but they do another; b) The people find it hard to get clear answers; c) The goal posts and guidelines keep changing. People can find such cultures to be frustrating. Why? People like clarity. They like to know the rules of the game. They can then decide whether they want to opt in and work towards achieving success. Different people respond in different ways in such cultures. Some simply go ahead and make their own rules. Some wait for clarity to appear. Some play safe and retreat into their own worlds. There seem to be few pluses in such a culture, though some people may find it justifies them doing nothing. There are, however, quite a few minuses. If you wish, try tackling the exercise on this theme. This invites you to describe your own experience of being in such a culture. 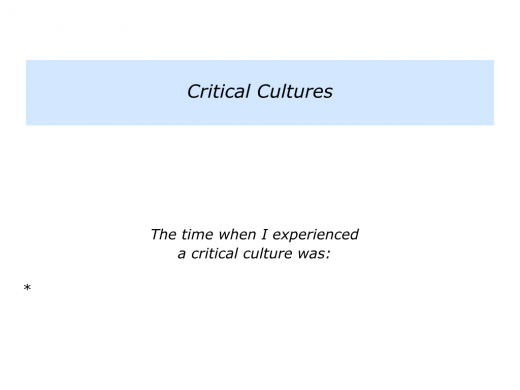 Critical cultures are those where people are frequently criticised. People obviously need to do superb work and be prepared to keep improving. But they are unlikely to perform well in a culture of fear. This sounds like old style management, but it is prevalent in some modern organisations. People think they can get on by being competitive, rather than by collaborating. They try to make themselves look big by belittling others, rather than by being supportive. There are few pluses to such an approach. Individuals may respond to threats by working harder in the short term, but this is unsustainable in the long term. People will leave because they don’t want to be bullied. Looking back, have you ever been in such a culture? 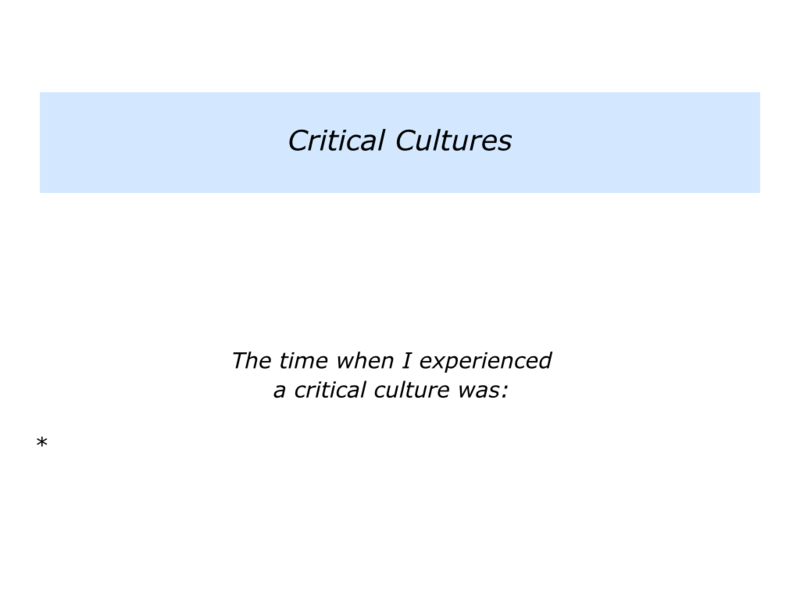 Was it simply critical? Or did it sometimes lapse into being cruel? What were the effects on people? If you wish, try tackling the exercise on this theme. This invites you to describe your experience of being in such a culture. Today it has become common to use the phrase: “Culture eats strategy for lunch.” The explicit and implicit Dos and Don’ts in a culture influence the way people behave. Bearing this in mind, can you think of a culture you would like to create in the future? You may want to create this in a family, team or organisation. What would be the characteristics of such a culture? You may, for example, want to combine elements of a caring, consistent and creative culture. If so, you may want to explore the following themes. How can you create a caring environment? How can you give clear messages about the desired standards? How can you encourage people to channel their talents towards achieving a common goal? If you wish, try tackling the final exercise on this theme. Looking ahead, this invites you to do the following things. Describe the specific kind of culture you would like to help to build in the future. Describe the specific things you can do to help to build such a culture. Describe the specific pluses and minuses of building such a culture.